Beat the cake mix and next 7 ingredients at low speed for 1 minute. Scrape the sides and beat for another 2 minutes on medium speed. Strawberries should be well blended into the batter. Pour batter into three greased and floured 9" round cake pans. Bake at 350 for 20 minutes, or until toothpick entered into center comes out clean. Cool cakes on wire rack for 10 minutes. Remove from pans and cool completely. 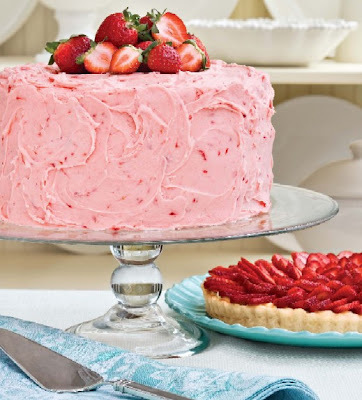 Spread the strawberry butter cream frosting between layers of cake, and then on the top and sides. Optional: For larger cupcakes, pipe a small amount of frosting inside from the top. Then pipe the frosting on top.